I recently booked tickets to travel by plane from the UK to Greece. The website I booked through (airfasttickets.co.uk) lists my name correctly, as "Mr Georgios [My surname]", exactly the same as in my passport. When I log in to the airline's (Aegean Air) website using the booking number the above website gave me, my name is somehow listed as "Georgiosmr [My surname]" (the title "Mr" seems to have been appended to my first name). Since I'm going to be travelling from the United Kingdom and my name is obviously non-english, I'm afraid they may have doubts about the "mr" at the end being a mistake instead of part of it and deny me entry. I've sent two e-mails to Aegean but it's been more than a week since the last one and 2-3 weeks since the first and they haven't replied. Calling them would be too expensive since they're based in a different country than my phone provider and I'd rather avoid it. Is there anything else I can do? Is it likely that they'll think "mr" is part of the name of the ticket's owner? A number of airlines will append your title (MR, MRS, etc) to your first name when they issue your boarding passes, so it appears as SURNAME/FIRSTNAMEMR. It can appear this way on the gate agent's terminal as well. I have not had any personal experience with Aegean Airline's system, so can not say with 100% certainty, but likely you are OK. Since very likely Aegean's custom, their staff should cope with interpreting this. The key point may be that the website you refer to does indeed recognise you correctly. Without a space it seems understandable that your forename is being interpreted as everything before the virgula suspensiva. "No need to correct your name: ... If your ticket shows your names in a different order, without spaces and/or with ‘MR’, ‘MRS’ or ‘MS’ between your names – this is how names are shown in our systems...."
Don't worry, it's a common way of writing it and all personnel at the airport knows how this works. I've worked in travel for over 10 years, so the rest of this post is based on that experience. In the "old times" airline reservation systems used to be white-on-blue screens full of cryptic codes and conventions. (And in fact, even though in many travel agencies better graphical interfaces are common, you can still see the "old-fashioned" displays even now - at the check-in desk of your airport they often still use these systems). Some of these conventions, established many years ago to - presumably - reduce the amount of network traffic and the amount of text that operators have to key in, carry over in today's travel. The obvious ones are the use of flight numbers (almost all flights are codeshares which have about 4 different flight numbers for the same physical aircraft - if I had to redesign the system I would change that) and the use of three-letter codes to denote airports (e.g. AMS, LON, CDG, LAX). The naming convention is also one of these conventions. In these text-based systems, names are still entered in the form SURNAME/ABCMR or SURNAME/FIRSTNAMEMR (Nowadays, for "security reasons", airlines usually require the full first name). One advantage is that the surname of passengers in the same booking only needs to be entered once, e.g. SURNAME/ALBERTMR/JENNAMRS/JOHNCHD (Again, security is now quoted as the reason that women need to provide their maiden name - one of the major causes of people being denied check-in is that they automatically provide their married name which is not necessarily the one in their passport). Is it likely that they'll think "mr" is part of the name of the ticket's owner? -- no, to an agent or customs officer at the airport who are used to reading the "cryptic" form, it will not be a problem. I would make sure you have supporting evidence of making the booking, eg have your credit / debit card that you made the booking with. When you Check-In, ask the Check-In staff to make sure that your name is printed correctly on the Boarding Pass. If you have problems with Security onto the plane they will usually just ask you to return to the Check-In desk and have your Boarding Pass name altered. Not the answer you're looking for? Browse other questions tagged uk tickets airports bookings airport-security or ask your own question. 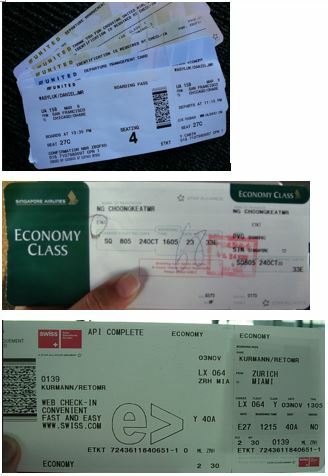 How to key in Asian names when making a flight reservation?